- The two optical axes should be coincident, forming one common axis. 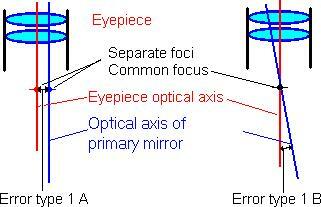 1A - The optical axes should intersect at the common point of focus. 1B - The optical axes should be parallel. A Newtonian telescope can be collimated to meet each of these requirements more or less closely, but as with mechanical adjustments in general, they cannot and need not be met exactly. This is the crucial error for visual use. Images by the paraboloid mirrors of Newtonians can be close to perfect near the focal point, but suffer from increasingly severe coma at increasing distances from it. Coma is an optical aberration that causes loss of contrast and detail resolution. It is approximately proportional to the distance from focus, and inversely proportional to the third power of the focal ratio f (this is the focal length of the primary mirror divided by its diameter). Any good eyepiece gives a very sharp view near its focus - that is, in the center of the field of view. Towards the edge, however, all eyepieces cause more or less un-sharpness of star images. This is mainly due to astigmatism (I won’t explain that here) of the eyepiece - it is not the mirror’s fault - but shows up worse with a short focus mirror (with a low focal ratio). For most eyepieces, the coma of the primary mirror gives much less contribution to the un-sharpness. The "sweet spot" in the focal plane around the optical axis, where coma has limited effect even at high magnifications, could be surprisingly small. Also surprisingly, a large telescope mirror does not have a larger "sweet spot" than a small mirror - the diameter is an only a function of the focal ratio of the primary mirror, not its size. This table gives the diameter of the "sweet spot" where coma is less than 1/14 wavelengths RMS, and the Strehl ratio is lowered by no more than 0.2 (this corresponds roughly to the rather obsolete Rayleigh "quarter-wave" criterion of diffraction limiting). 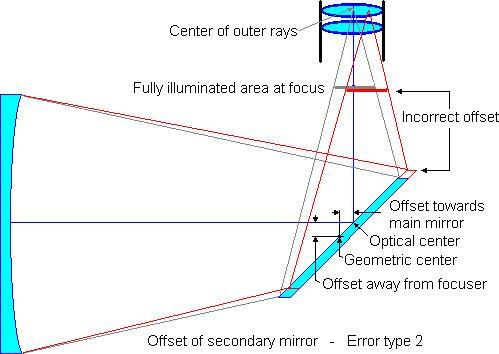 If you have a center spot that happens to be at a distance D from the true optical center, and do a perfect collimation against it, the collimation error 1A at the focal plane is half the distance, or D/2. Thus, for critical collimation, the allowable miss centering of the center spot should not be more than the diameter of the "sweet spot", and preferably less than half the diameter. Let us assume that collimation of the primary is perfect at the center of the field of view, but the focuser's axis misses the center of the primary by a distance b. This means an angle of tilt = b/F where F is the focal length (in radians - multiply by 57.3 to convert to degrees). At a point a distance m from the center of the field of view, the defocusing distance d between the planes is dm/F. The P-V defocus error in wavelengths is (Suiter): dm /(8Ff2*λ) where λ is the reference wavelength of 550 nm - to obtain the RMS error, this is further divided by √12. If this error is no more than 1/3 of the unavoidable coma, it means it will not contribute more than 10% to the total wave front deviation - even disregarding other contributing aberrations such as curvature of the focal plane of the primary but also of the eyepiece, as well as off-axis astigmatism of the eyepiece itself. Coma will give an RMS aberration of 6.7m/f³, this leads to the tolerance d=0.034D where D is the mirror diameter, (rather surprisingly, the focal ratio and focal length are eliminated from this expression!) or about 1/30 of the mirror diameter. This should not be difficult to meet. 1.414 (the square root of 2). Example: with a 33 mm secondary mirror (the size refers to the minor axis) in an f/6 Newtonian, the offset is 33/(4*6) mm = 1.3 mm. uneven light loss near the edge of the low power field. 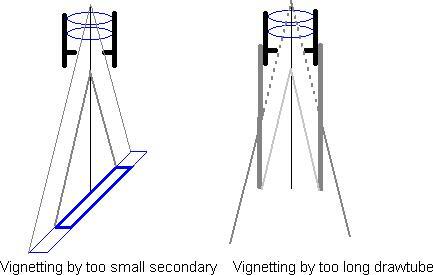 For wide-field photo, the secondary mirror should be large enough to let the whole film frame be fully illuminated, but for visual use, a secondary size of no more than 20-25 % of the primary mirror diameter is commonly preferred, in order to minimize unwanted diffraction effects. This means there is usually some light loss by the edge of the field, but at least the focus should always be fully illuminated - the tolerance should not be larger than the radius of the fully illuminated field. At least for short focus instruments, light loss is very gradual outside the fully illuminated field, and an offset of a few millimeters should have little effect visually. Sufficient accuracy is easily achieved with suitable tools. One practical way is to do it in the order described below (you could perhaps do it in the opposite order, but I believe it is much more complicated). Remember that this refers to a full collimation, like when you assemble the telescope from parts - you do not have to go through all of this just to get your telescope ready for the night’s observing! With a truss tube that you assemble at the observing site, you should do step 4, else step 5 (and maybe step 8) is usually quite sufficient for this. In the first three steps, you place the focuser and secondary within the upper end of the tube. You can use a simple or combination sight tube, as described below. You may also use a crosshairs sight tube or a laser collimator. If the focuser appears to be squarely mounted on the tube, it is not likely to be badly off - however, if you find it impossible to perform step 3, this could be the reason. You can make a small mark directly opposite the focuser hole. 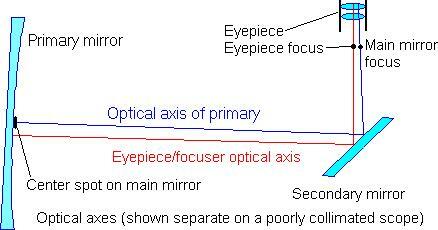 With the secondary mirror out of place, use a sighting device in the focuser. 4	- Tilt the secondary mirror to make the extended optical axis hit the center of the primary mirror. Use the appropriate setscrews on the secondary mount - depending on the design, you may also rotate the secondary holder to center "sideways". You can use a single or double crosshairs sight tube, by centering the spot on the crosshairs. You could also use a simple or combination sight tube, by centering the primary mirror within the sight tube end (if you don’t have a center spot, this is one way, another is with a holographic laser). Perhaps the most convenient tool is the laser collimator, making the laser beam hit the center spot. If you plan to use the laser also in step 5, it is imperative that the centering is very accurate, else you only need to make sure the error is no more than perhaps 1/300 of the focal length, or 1-2 percent of the diameter of the primary. 5	- Tilt the primary mirror, to center its optical axis in the focuser. 6	- Check the centering of the optical axis in the telescope tube and in the focuser drawtube. A coarse test is to look through the empty focuser tube and check if you can see the outer tube end reflected in the primary mirror from any point within the focuser. If you can’t, the centering is OK optically. (25-50x per inch). Do not trust this step unless the seeing is good enough to clearly discern the diffraction rings. If there is a marked asymmetry, try and see if the image improves if you place it off center in any direction. If so, try to tweak the primary mirror to move the image towards the center of the field, in steps until it looks symmetric (If you start with a nearly perfect collimation, it will save you a lot of tweaking). If your telescope is new, or if you have moved the spider, you can check that the spider veins have not been tilted or twisted during collimation. Look down the tube and move your eye to see each vane look its thinnest, and check that you see it centered against the mirror (if the vane is centered - otherwise, check that you see it over the corresponding part of the mirror). If offsetting the secondary mirror makes the vanes slightly out of line, or out of perpendicular, this may make the diffraction spikes look less distinct or pretty, but it does not affect the sharpness or contrast of the image. You can also check that the collimation holds at elevations from some 20 degrees to zenith (some primary mirror mounts, where the mirror isn’t glued or clamped, will not hold the mirror firmly enough to use all the way down to the horizon). If the collimation cannot be kept within tolerances, there is some weakness in the tube. It may be the primary mirror support, but it may also be the spider or the secondary mirror mount that is not rigid enough. If you dot the geometric center of the secondary mirror face, and center this dot in the focuser (using a crosshairs sight tube or a laser collimator) and also center it inside the tube, you will get a truly non-offset secondary. This has been recommended, but it will give an error (usually acceptable) of type 2, and I don’t see that it would be simpler, or offer any other practical advantage. (If you use a holographic laser, the shadow of the secondary can only be centered in the pattern with non-offset - or non-existent - collimation. Some manufacturers recommend you to check this centering as a last step of collimation, but I believe it is better not to). If you have optically centered the secondary in a sight tube as described above (step 3), it will be correctly offset along the tube. But what happens if your secondary is centered within the tube, without offset away from the focuser in step 2? This is sometimes called "non-offset collimation", or "neither centered, nor offset, but a compromise" (Menard/D’Auria: Perspectives on collimation). This is a small (but not too small) circle (square or even triangle is OK, too) of tape or paint placed in the center of the mirror - it is invaluable. Please note that it is always in the shadow of the secondary mirror, and does not interfere with the image. Regrettably, manufacturers often omit it, and if your mirror doesn’t have one, I recommend you make one. Hey - it isn’t even my own ‘scope and anyway I wouldn’t dare take it to pieces and risk putting my fingerprints all over the mirror - isn’t there another way? The reflection of the secondary mirror - but note that this image (and only this) is not concentric. The reflection of the drawtube and peephole cap (if transparent or semi-transparent - if not, it will be too dark to see). You cannot, of course, see the inner opening and the mirror edges perfectly sharp at the same time, but the small peephole will improve your "depth of focus" and keep the un-sharpness tolerably low. - or at least to within acceptable tolerances. To center it "sideways", you may have to move the spider veins - if this is not possible, shim the focuser sideways instead. To aid in checking tolerances, you could put small protrusions inside the tube at its inner end (I have used strips made from the tubing, 2 mm high and slightly wider and longer). These act as tolerance gauges - if you divide the height by the tube length you get the angle in radians (multiply by 57.3 to get degrees) that the gauge is seen by. My f/6 tube is 168 mm long and the gauge is 2 mm high, the angle is 0.68 degrees (approx. 2/3 degrees). If I have centered as shown above, and the black rim is almost gone at one side and as high as the gauge at the other, then the error type 1B is half of the angle, or 1/3 degree - this is usually acceptable but I would try to halve this error. To judge the centering of the secondary, you can multiply the gauge height by the ratio (secondary size)/(inner diameter of peephole tube). If secondary size is 84 mm and inner diameter of tube is 28 mm, errors should be multiplied by 84/28=3.0. In the illustration above, error is half the gauge height times the multiplication factor - that is ½*2*3 mm=3mm. 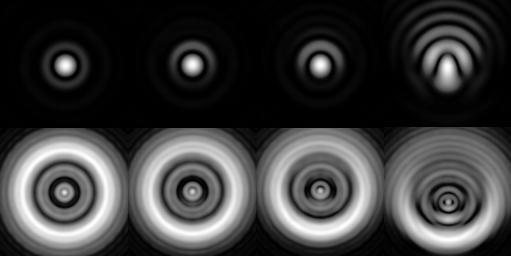 These images were taken through a combination sight tube - the offset of the secondary relative to the black center spot is obvious in this f/4.35 instrument. The spot is 15 mm dia. and the bright face 25 mm. In the first image, the edge appears to vary from approx. 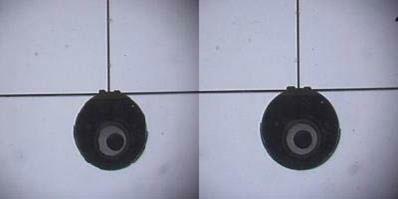 2 to 8 mm - this is 3 mm offset, or 1.5 mm error type 1A at the focal plane, this is not acceptable. In the second image, the width varies from 4 to 6 mm i.e. 1 mm offset or a 0.5 mm error type 1A. I would accept it. WARNING: Never look at any laser beam directly! Normally, the beam will stay within the optical path of the telescope, but if it is badly out of collimation, the returning beam may escape beside the secondary. Do not look down the tube if you don’t see it return as expected - instead, try picking it up on a piece of paper in front of the tube. The laser collimator can be expensive and impressive, and favored by many. It makes step 4 very simple, as you can stand by the tube opening and easily see where the beam hits the primary mirror while you adjust the screws on the secondary holder. Seeing where the beam returns can be harder, particularly if the returning beam has been focused by the primary mirror to make the spot smaller than the exit hole. One trick is to see the scattered light where the beam hits the secondary on its two-way trip. 6. However, contrary to what some manufacturers claim, it is not very useful in step 5. After step 4, if the laser beam is off the primary mirror center, the return beam will be parallel to the optical axis, but displaced (by the same amount) at the return. If you then adjust the primary mirror to center the return beam accurately, you unwittingly miss-collimate and get a 1A error (of half the displacement). For instance, a critical tolerance for a f/4.5 mirror may only be some 0.5 mm or 0.02 in., so the allowable error in step 4 should be much less than twice this (1 mm or 0.04 in.). With many telescopes, it is not really possible to read the position of the spot (or even adjust the secondary holder) to anywhere near the required precision. On the other hand, if you allow a type 1B error of 0.2 degree (assuming a 70" = 1.8 m focal length), the spot can be 1/4 in. or 6 mm off! The name may suggest that this is a device that will automatically collimate your telescope - sorry, but it won’t. It is another development of the simple peephole tube, with a mirror inside the cap. 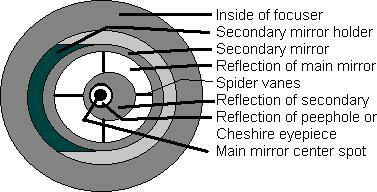 There is a transparent spot in the center of the mirror, used as a peephole, and the mirror is set accurately perpendicular to the tube (there are other devices called "autocollimator" too - if you search the net for more info, don't be confused). I have had a rather skeptical view of it, mostly because I have found the instructions unclear and to some extent unreasonable in claims. During this discussion, I tried to derive exactly how the reflections seen in an autocollimator relate to miss-collimation. In brief, you may see 4 reflections of the center spot (if illuminated! ), all of them stacked on top of each other if collimation is perfect but offset from each other if either the focuser or the primary axis (or both) is miss-collimated. This is shown with high sensitivity, but since it is the combined error that is shown, it is not readily apparent what to adjust! However, if you have collimated the primary as accurately as possible using a Cheshire or Barlowed laser, any errors shown will be of the focuser axis (particularly if aligned with a sight tube), and gentle adjustment of the secondary (or better the focuser, if adjustable) will bring down the 1B error to the same low level as the 1A error already minimized. It can also be used as a "sanity check" - if, after careful collimation, the autocollimator shows significant miss-collimation, it would indicate a problem somewhere in the procedure - or perhaps a tool such as a laser collimator out of adjustment. Don’t worry. A Dobsonian telescope is a special kind of Newtonian, with a simple but very efficient mounting that distinguishes it from other Newtonians. Optically, and as far as collimating is concerned, they are the same. 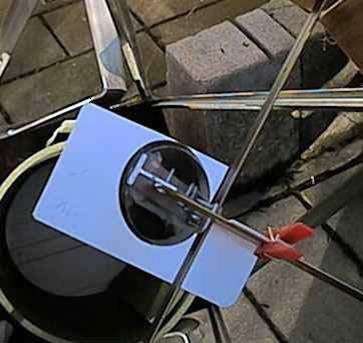 The main mirror must be held in place without stress that could bend it and change the optical figure, and cannot be rigidly held - it may shift slightly whenever you transport or shake the tube. The secondary mirror is also held by a "spider" that may change its position ever so slightly, and as we will see, it doesn’t take much to disturb the collimation enough to really matter. If you move your telescope to darker skies and back, and particularly if you have one with truss tubes that you assemble and disassemble, you must be able to check the collimation each night out, and you must be able to tweak it whenever needed. If the situation is that bad, maybe a Newtonian isn’t for me. Should I trade it in for something better? Don’t forget - a complete collimation of all the optical components is a bit of work - but the nightly checking takes a few seconds, and the tweaking, if needed, may take a minute. When I tried to figure out the how’s and whys of collimating, I had very little help of the manual for my 6-incher. I tried reading the sections on collimating in a few magazines and handbooks, without really understanding what should happen, and why. I kept on trying, and in due time I felt my efforts paid off. That is why I write (and re-write) this - I hope I can make it easier for you. But let me point this out: Much of what I write here is common knowledge, even if it is not easy to come by, but some is the result of my own studies and experiments - particularly the error analysis and some of the tools - and my recommendations here are very much my own (and very controversial in some places). I believe it is sound advice, but I may be wrong on some accounts - if you really find fault with what I say, don’t hesitate to email me. Let it also be said that collimation is a subject of much heated discussion among us diehard Telescope Nuts, and I doubt that this will put an end to it (on second thoughts, I know for certain it won't! ).